This exhibition ran between 29th April and 7th August 2016. The exhibition was jointly curated by Dr Ross Balzaretti of the Department of History and Manuscripts and Special Collections at The University of Nottingham. This exhibition took the visitor on a journey through the history of travel since the sixteenth century drawing on The University of Nottingham’s rich archives. 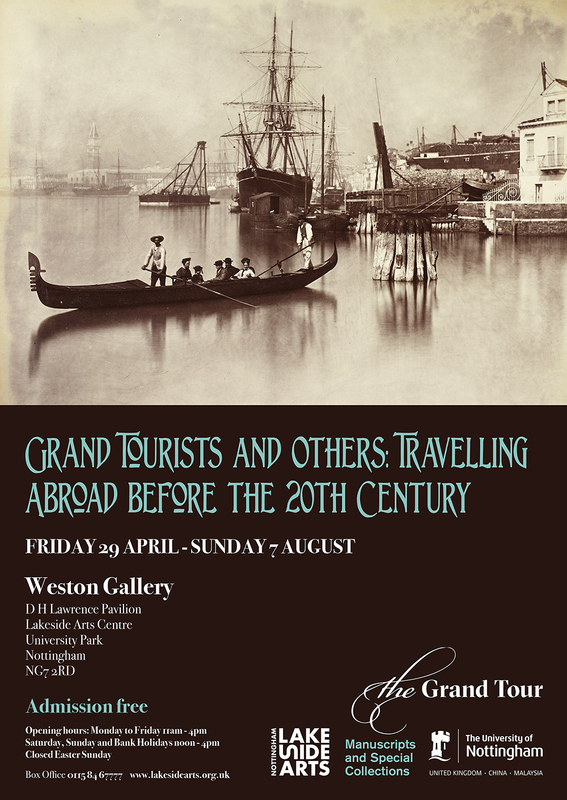 Beginning with the elite ‘Grand Tour’ of the seventeenth and eighteenth centuries and ending with the more commercial tourism of the mid-nineteenth century, the exhibition explored the travels of local families and others throughout Europe and beyond. People travelled for education and pleasure, to buy and sell things, to escape pressures at home, and much more besides. The trips of men and women, girls and boys, servants and even pets are recorded. Many places across Europe and some beyond featured among the exhibits, with a special focus on Italy which became and remained the country most people were keen to see. Exhibits included passports, diaries and journals, sketches, bills, prints, photographs and guide books, objects which are still familiar now when we travel abroad. Superb exhibition. I feel inspired to go on my own journey!